Carnival in Brazil? 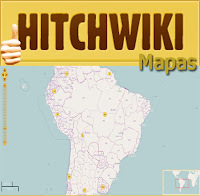 Get to your favorite destination by hitchhiking! Carnaval no Brasil? Chegue ao seu destino preferido pedindo de carona! Carnaval Internacional de Raul Soares - tive que ilustrar pra mostrar que é logo ali!! Vamos começar em 2010, então. Sem escrever historinhas demais, fica o vídeo desse ano. Em 2011 a gente foi mais doido, saímos de carona de dentro da PUC lá no São Gabriel (do outro lado da cidade) de carona com um amigo da Letícia que resolveu do nada que queria ser nossa primeira carona na nossa aventura pedindo carona a noite rumo a Raul Soares. Já eram umas 11 horas da noite e a gente ainda desceu do ônibus em outra saída da cidade, indo pra sentido errado. 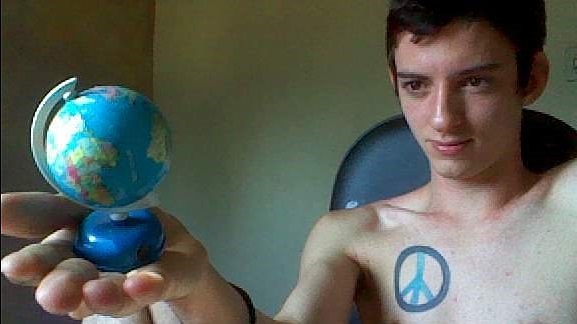 Ficamos lá pedindo carona até um cara que parou pra fazer xixi vir dizer pra gente que não tinha sentido algum a gente estar ali se íamos pra outro lado. Ok, nos viramos e chegamos na saída certa. No meio do nosso trajeto, chegamos em Ouro Preto durante a madrugada e - porquê não? - resolvemos curtir o resto da madrugada curtindo carnaval lá mesmo! Aí quando amanheceu, pegamos estrada rumo a Raul Soares. Eu ainda nem conhecia a Day até esse dia que a gente resolveu se encontrar pelas 18h em um ponto de BH e pegar ônibus pra saída da cidade, pra de lá pedir carona rumo a Raul Soares. Ela que é linda e inteligente, nos trouxe vodka e energético que a gente foi tomando dentro do ônibus mesmo, durante umas meia hora que ficamos agarrados no bendito trânsito de toda sexta-feira de carnaval. Chegamos lá onde fomos pedir carona já meio lezados já. E eu fui fazer o vídeo em ingrêis, né? Com um ingrêis belezura, mas que ainda serve de ajuda pros gringo que não entende meu português da roça. Seguindo a linha do carnaval internaixxxonal, porquê não um videozim em espanhol pros nossos amigos hermanos da América do Sul aprenderem a chegar em Raul também? Se bem que o espanhol baleado não durou muito e acabei trocando de novo pra portuguêix quando vi que minha situação não era das melhores. hahaha Eu tava na Argentina uma ou duas semanas atrás, tava voltando só por causa do carnaval de Raul e já tava super ansioso e com pressa nesse dia porque já era dia do carnaval começar, quinta! Se tiver ficado curioso pra saber mais detalhes dessa história, aproveita que cheguei a escrever um post contando com mais detalhes aqui. Quem quiser ver a prova que o carnaval de Raul Soares é mesmo internacional, clique aqui pra ver o vídeo do Fabián, meu amigo argentino que foi de Buenos Aires num vôo direto pra BH e de BH um ônibus direto pra Raul Soares nesse ano. Aprende a ir, mas não desespera porque tem como voltar também! Na verdade esses são só alguns dos vídeos que peço carona nesses trajetos, se quiserem mesmo dicas de onde pedir carona nesses trechos tente buscar algo assim ou entre em contato que tento ajudar como der. Indo curtir uma tarde na represa do Emboque, onde vc tem que ir! Brazilian carnival is knocking the door.. It begins in 2 weeks. Because this year I won't be there, what I can do is sit down in front a computer and write this post with a retrospective of the past 4 years when I got the road in the last days before the carnival heading to my home town in the country! Let's start with 2010. Instead of writing too much, I'll just leave this video. In 2011 we made it in a little more "crazy" way. A friend of my friend decided that he would give us our first ride in that night, departuring from inside the campus of PUC São Gabriel university (which is in the other side of the city). It was already around 11 pm when we finally got in the right exit of the city where we supposed to be 2 hours ago but we couldn't because we got a little lost on the way when a bus driver indicated us a wrong direction where we've tried to hitchhike about 20 minutes until someone tell us we were on the wrong way. Already on our way there was Ouro Preto, which is a historical city and famous for it's carnival. So - why not? - we just decided to spend the rest of the night enjoying the carnival in the city as we got dropped off just in the middle of it during the dawn. When the sun raised again, we got back to the road heading again to Raul Soares, arriving there in the afternoon. I didn't even know Day in person until this day when we decided to meet up around 6pm somewhere in Belo Horizonte to take a bus to the border of the city and hitchhike from there to Raul Soares. As she is a smart girl, she brought us vodka and Red Bull which we ended up drinking them all just during the half hour that we had to spend inside the bus stuck on the regular city's traffic of a Friday of carnival. So I made the video in drunk-english-half-drunk-portuguese, but I still believe that it might end up been useful to any unknown foreigner one day. Following the idea of internationalization of the Raul Soares caaarnival, why not a video now in spanish for our southamerican siblings to learn how to get to the country haciendo dedo (hitchhiking)? Even though it hasn't lasted too much until I give up on speaking spanish and switched back to portuguese because I got pissed off with my situation on a hard and rainy day to get a ride on the road. hahah I was actually coming back from Argentina, where I was two weeks ago, and I was back just for this carnival! I was extremely anxious and in a hurry to finally arrived in the for the first carnival day, and it was already thursday! If you're curious to know more about this trip, I've wrote a post about it with more details here (only in portuguese and spanish unfortunately, but you may try Google translation). 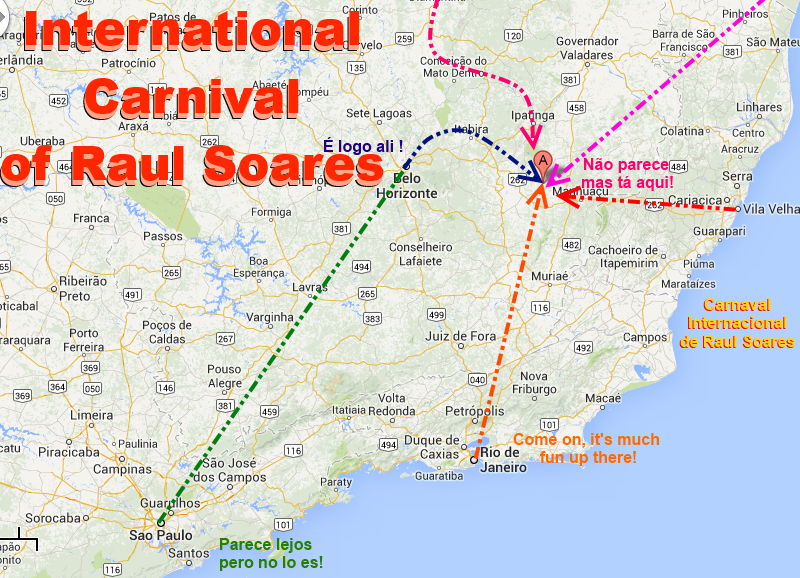 If you wanna see how Raul Soares carnival is international, check out this video to see my guest Fabián, a friend from Argentina who came all the way from Buenos Aires taking a flight to Belo Horizonte and a bus straight to Raul Soares for the carnival in that year. I taught you how to go, but don't panic! I teach you how to go back too! These are actually just a few of the videos that I've made hitchhiking in those routes, if you really want some extra tips/advices/etc just try Googling something like this or get in touch and I'll try to help you as much as I can. On the way to the dam Emboque, where you should visit!